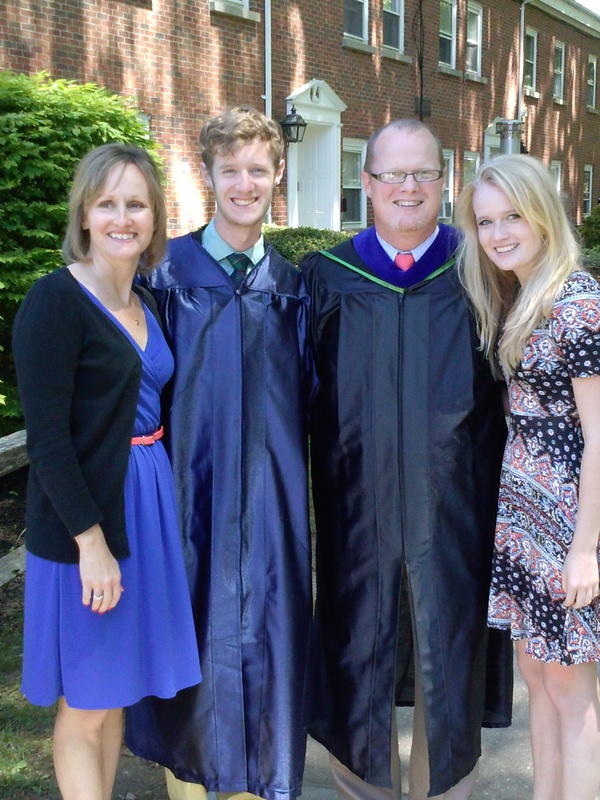 Prior to Jake’s graduation, I wrote about all the “lasts” the week held. I attempted to articulate some of the thoughts I was experiencing as a mom of a soon-to-be high school graduate. Now, three weeks have passed. Graduation is over, the Open House a memory, and some more thoughts have bubbled to the surface. The final days before graduation were busy. Both Brad and I had finals to give and grading to complete, along with prepping for an Open House and attending all of the end-of-year functions. Thankfully, my parents arrived a few days beforehand and were a big help with all the last minute details. Given the intensity of those days, I wondered when the “cry” would come. I don’t cry at the drop of the hat, but I knew the rollercoaster of emotions and the tiredness would catch up with me eventually. One of the meaningful graduation traditions at the school is for bagpipers to lead the commencement processional. This year I was near the front because I was a scripture reader for the ceremony and sitting on the dias with the other big wigs. Hearing the first strains of music, I felt tears spring to my eyes and my smile wobble. Willing myself not to burst into tears at that moment, I forced a smile and made it through the day’s events. Last week the cry finally came. It was a recovery week in many respects. Once all the official festivities ended, Brad and I had end-of-year faculty meetings to attend the week after graduation. In addition, the evenings were filled with events ranging from a baby shower to two going-away parties. Oh, and I did I mention that Anna turned 16 that week? So I shouldn’t have been surprised that while discussing dinner options with Jake one night last week I suddenly burst into tears. Covering my face with my hands, I hurried out of his room and boo-hooed for several minutes in the privacy of my own room. I’m sure he must have wondered if his mom had really lost it. Once the dam broke, I felt weepy for several days afterwards. Another reason for the lingering tears, is the result of finally watching the television show Gilmore Girls. After having several friends recommend it, I am watching it on Netflix and loving it. I love it for all the reasons they said I would: the quick wit, the snappy dialogue, and the relational dynamics. I think I enjoy the show all the more now that I live on the Northeast, which is where the show is set. Ironically, the end of season three focuses on Rory’s high school graduation. Lorelai and Rory are the two main characters in the show and also mother and daughter. Watching this episode, I felt waves of emotion wash over me again. The beginning of season four starts with Lorelai moving Rory to college; something I will experience in mid-August. Perhaps the word “bittersweet” gets trotted out too often, but I can’t think of a better way to describe this season in my life. Since the day Jacob was born, time has been slowly (sometimes if feels too fast) moving towards this day and all the independence that comes with having an eighteen year old headed off to college. This is the sad part. I don’t quite feel ready. Who does? All the familiar cliches come to mind: Savor each moment, Be present, etc. The sweet part is watching a likeable, young adult emerge. I am excited for him and his new opportunities. The next four years will be filled with all sorts of adventures. In the meantime, I plan to enjoy these summer months and to make a few more memories before August. Next Do You Want a Friend?